With its magnificent castle, its beautiful bridges, its stunning squares, its spectacular public buildings, its imposing towers, its old towns and its vibrant squares, its easy to overlook Prague’s quiet little streets. While you may be consumed by epic stag do ideas during your visit to the city, it’s worth taking the time to wander through the quite streets to discover some of the city’s loveliest houses and some of its most fascinating history. Depending on your approach, Nerudova Street curves gently down or steeply up the hill below Prague Castle. It takes its name from Czech poet and journalist Jan Neruda, who immortalized the district in his short stories He lived here, between 1849 and 1857 first, in number 47, or At the Two Suns and later in number 41, At Three Black Eagles where he wrote his first collection of poems. Although Nerudova Street attracts crowds of tourists with its quaint shops and cafes and restaurants, it is most famous for its “house signs”. Before the introduction of house numbers in 1770, all Prague houses were distinguished by picturesque signs. Today they tell the history of the house and the people who lived in them. At the Three Fiddles or number no. 12 was once the home of three very successful violin-makers who sold their instruments all over Europe. Legend has it that on quiet nights the house echoes with the haunting strains of violins. At the Red Lion, or number 41, a red lion holds a golden cup in his paw. This was the home of Petr Brandl, the famous Czech painter work adorns several Prague churches. At the Golden Lion, or number 32, holds the National Museum’s Historical Pharmacies exhibition. The Golden Horseshoe is at number 34 and At the Red Eagle at 36. The Green Lobster is at number 43 and The White Swan is at number 48. Steeped in small stories, lined with beautiful little buildings and full of surprises, Nerudova Street is a wonderful wind down from the overwhelming might and splendour of Prague Castle. Quaint and vibrant Celetna Street leads from the Old Town Square to the Powder Tower. 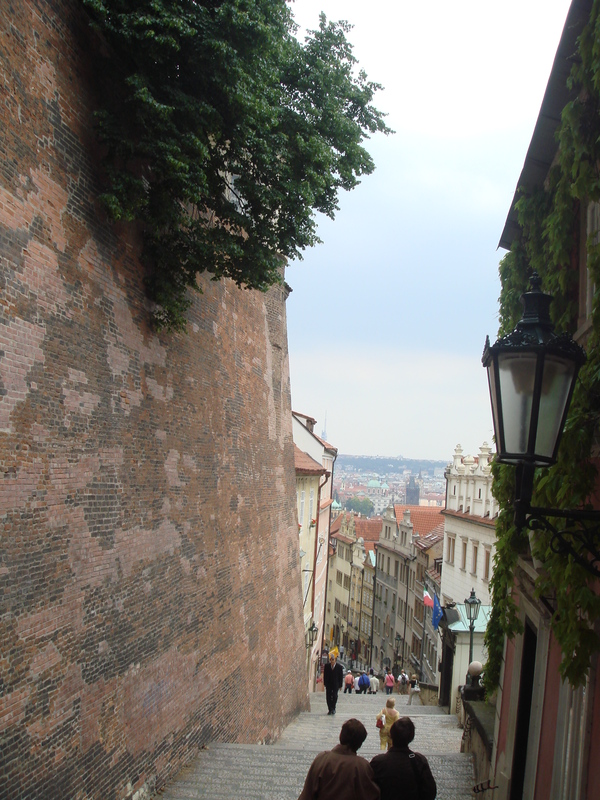 It was once part of the Royal Route followed by the Czech Kings up to Prague Castle. The name Celetna derives from the traditional plaited bread rolls which were made in its bakeries for centuries. Today Celetna Street is a popular tourist spot. Crowds stroll in its shade by day and in its romantic light by night. It is lined with souvenir shops, cafes and restaurants. Still, it is the historic houses, marked by picturesque “house signs” which give Celetna Street its distinctive character and charm. 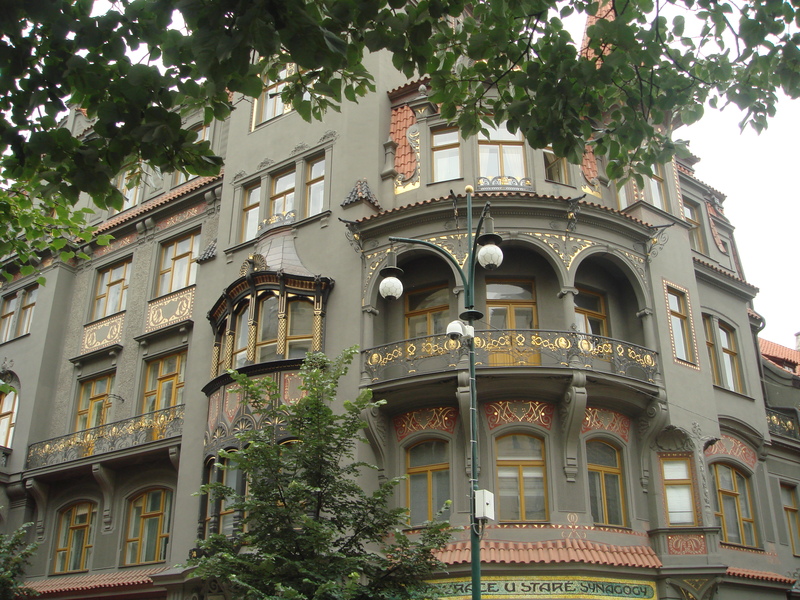 The Sixt House, number 2 and At the Three Kings, number 3, are both former homes of Prague’s most famous writer, Franz Kafka. Josepha Duskova, Mozart’s mistress, once lived at number 8, At the Black Sun. The Manhart House, at number 17, was once a Piarist College but now houses a theatre At the Vulture, number 22, was one of Prague’s early breweries but since the 18th century it has been part of Charles University. At the Four Columns, number25, was the home of Theologist Bernard Bolzano. The Buquoy Palace at no. 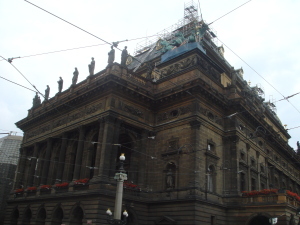 20, also now part of the Charles University, is a Neo Classical gem. At The Black Madonna, which was the first cubist building in Europe, is the street’s most famous house. It now houses a permanent exhibition of Czech cubism and its Grand Orient Café sells special cubist cakes. For history buffs, lovers of architecture and romantics, a stroll down Celetna Street is a must. Josefov, the Jewish Quarter, which lies between the right bank of the Vltava and the Old Town Square, is one of the oldest, most historic and most architecturally interesting parts of Prague. The first Jews arrived in Prague in the 10th century during the reign of Prince Borivoj Premyslovic. They were merchants, following trade routes across Europe into the new market town below Prague Castle. In the 11th century, during the prosperous reign of King Vratislav II, Jewish settlers, attracted by commercial opportunities, arrived and set up businesses on the right bank, near the market square in the Old Town. A settlement grew around them, with houses, synagogues and a cemetery. In the 13th century, during one of many periods of persecution, all the Jews in other parts of Prague were herded into the Jewish quarter. Their movements, as well their trades and professions, were restricted. More and more Jews, prohibited from other parts of Prague, crowded into the area. Walls were thrown up to contain it. It became a ghetto. Over the next century savage Pogroms took place, the worst of which was the 1389 Easter Sunday massacre of 1,500 people. Towards the end of the 16th century, conditions improved in the Jewish ghetto. The philanthropic Emperor Rudolph II’s Imperial Charter granted new religious freedoms. Jewish scholars and philosophers arrived in the city, among them the Maharal Judah Leow Ben Bazale. Legend has it that the Maharal created a magical golem from Vltava clay to protect the Jews of Prague. The golem was so powerful that Emperor begged the Maharal to destroy it. It was confined in a coffin which, apparently, still lies buried in Josefov today. Under the protection of the Emperor Rudolph, the Maharal and the golem, the population in the ghetto grew to 1500, about one quarter of Prague’s total. The Jewish Mayor, Mordechai Maisel became the Minister of Finance and his money helped to develop the ghetto. This was a golden age for Jewish Prague. In 1779 restrictions on Jews eased. They were allowed to settle outside the city and as the liberal and the affluent abandoned it, only the orthodox and the poor remained in the Jewish Quarter. In 1781, the Emperor Joseph II’s Edict of Tolerance emancipated the Jews of Prague and in gratitude, they named the Jewish quarter Josefov. In 1850 Josefov achieved the status of a town. Between 1893 and 1913, during the frenzied renovations and re-builds that marked the new Austro-Hungarian Empire, much of old Prague was demolished to make way for a new city, modelled on Paris. Afterwards, all that remained of Josefov was six synagogues, the old cemetery, and the Old Jewish Town Hall. In 1939, the Nazis arrived. The Jewish population of Prague was systematically removed – murdered or transported to concentration camps like Theresienstadt or Auschwitz. The ghetto was once again a ghost town. Incredibly, it was not demolished but preserved as an “exotic museum of an extinct race”. Jewish artifacts were gathered from all over central Europe for display in Josefov. Today, Josefov is a picturesque quarter of narrow lanes and old stone buildings. The Jewish people, although decimated in number, have returned and their story continues. Josefov is a peaceful village, despite the thousands of tourists that stream through its streets, where businesses trade, in tiny shops and stalls, in fine lace decorated with Judaic motifs, in candles, menora and yamulke. In the Jewish Museum 40,000 exhibits of textiles, art and silver and 100,000 books from all over Bohemia and Moravia, tell the long and fascinating story of the Jews of the Czech Republic. 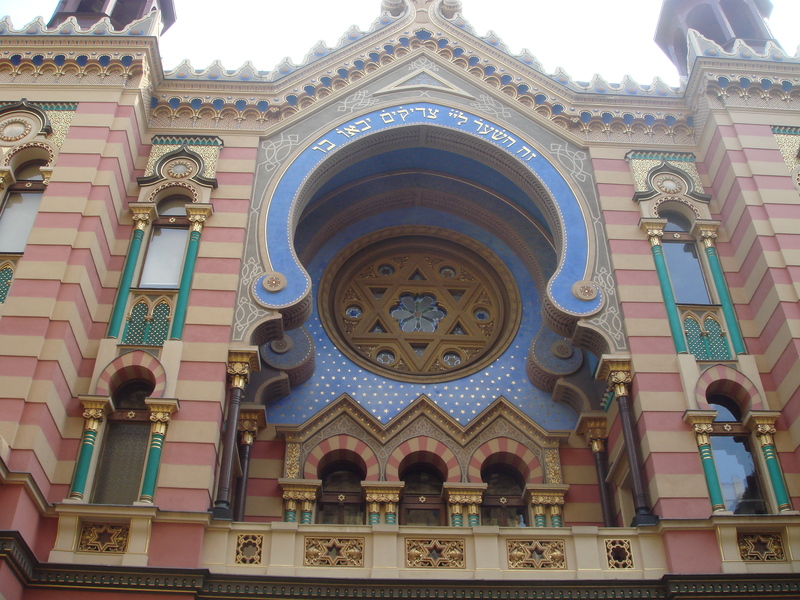 The Old-New Synagogue is the main house of prayer for Prague’s Jewish community. Built in the 13th century, it is the oldest synagogue in Central Europe. It is in the Gothic style and is richly adorned with elaborate stonework. All the interior furnishings are originals. The Jewish cemetery holds the graves of centuries of souls who have lived in Josefov. Its most famous include those of the Maharal Judah Leow Ben Bazale and Franz Kafka. Most of the historical sights in the Jewish Quarter come under the auspices of the Jewish Museum and a single ticket gains entrance to all its buildings, including the Town Hall and the six synagogues. The Jerusalem Jubilee Synagogue is a landmark in early twentieth century Prague architecture as well as an important spiritual and cultural centre for Jewish Prague. Every cloud has a silver lining, as they say, and although the reconstruction of Prague’s Jewish quarter, Josefov, in the late 1800s, gave the kiss of death to three lovely old synagogues, it also gave birth, in the next century, to the Jerusalem or Jubilee synagogue, the city’s largest and most spectacular. A “Society for the Construction of a New Temple” was founded in 1898 and in January 1899, it purchased a site for the building. Interestingly it was not in Josefov but in Jerusalem Street in the New Town. In 1904 Viennese architect Wilhelm Stiassny’s design was approved and construction began in 1906. The synagogue was dedicated on 16 September 1906 during the festival of Simhat Torah. As this was also the 50th anniversary of the Emperor Franz Josef I, it was name the Jubilee Synagogue. 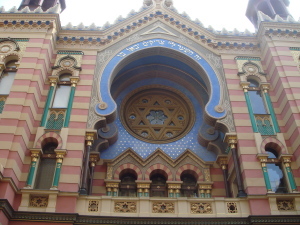 The Synagogue combines the contemporary Art Nouveau and ancient Moorish styles. It consists of a triple-nave with two transverse wings. The main facade features a large Islamic arch surrounding a rosette window with a central Star of David. On the perimeter, an inscription from Psalm 118:20 reads “This is the gateway to the Lord – the righteous shall enter through it” A marble tablet, flanked by two turrets sits on the front gable. The arched entrance is inscribed with a verse from Malachi 2:10 “Have we not one Father? Did not one God create us?” The interior is lit by stained vast glass windows and ornate chandeliers. Two rows of Islamic arches support the women’s gallery above. In the main nave is an inscribed tablet from the Zigeuner, one of Josefov’s demolished synagogues. The high Ark (aron ha-kodesh) is ornamented with a vine leaf motif and the tablets of the Ten Commandments. During the war, the Jerusalem Synagogue was used as a warehouse and, as a result, was spared destruction. The Jerusalem Jubilee Synagogue is open for prayer on Saturdays at 9.00 a.m. all year and on Fridays at 20:00 from April to September. During the summer months, it is open to the public and is also used as a venue for concerts and exhibitions. With a skyline pierced by thousands of church steeples, Prague is often called the city of spires. Star among those many houses worship is the Cathedral of St. Vitus, St. Wenceslas, St Adalbert Cathedral, commonly known as St Vitus Cathedral, which stands alongside Prague Castle. The first church on the site was the Romanesque Rotunda, dedicated to St Vitus, commissioned by Wenceslas in 929. 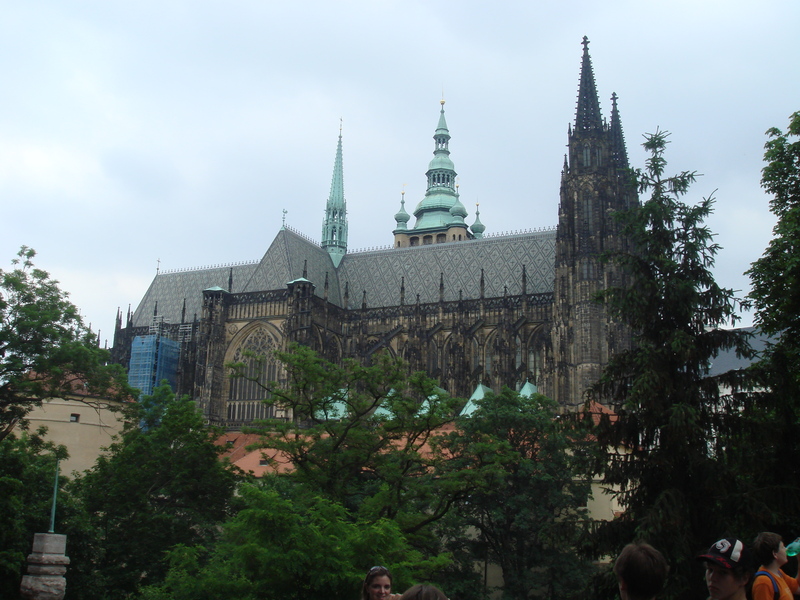 In 1344, when Prague became an archbishopric, King John the Blind commissioned a new church to mark the occasion. The project was continued by his successor King Charles IV. The first of the many craftsmen to work on St Vitus was French master mason Mathieu d’Arras. Next was German sculptor and woodcarver, Peter Parler who added his own unique Gothic style. Parler’s sons took over when he died, completing the clock tower and transept in 1399. 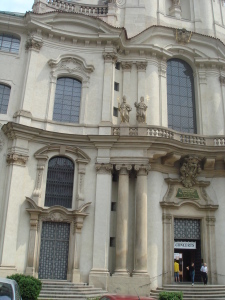 The Cathedral remained untouched until 1770, when the Italian-Austrian architect, Nicolaus Pacassi, added a Baroque dome. Still the cathedral remained unfinished until 1873 when, thanks to the efforts of a group of concerned of Prague citizens, Josef Mocker began construction of the west façade. St Vitus was finally seen to completion in 1929 by Kamil Hilbert. Both Mocker and Hilbert followed the plans of Peter Parler. If the Cathedral’s exterior is magnificent, with its baroque dome, its great gothic windows, its turrets and its towers, the interior is breathtakingly beautiful, with its many chapels, its monumental tombs, its frescoes and its stained glass windows. Among the many masterpieces of St Vitus are the Cyril and Methodius stained glass window, created in Art Nouveau style by Alfons Mucha, the St Wenceslas chapel which is decorated with more than 1,300 semi-precious stones and the huge silver sepulchral monument of John of Nepomuk, by the Austrian architect Joseph Emanuel von Erlach. Known affectionately as the pearl of Prague, the Cathedral of St. Nicholas in Malo Strana, is one of the city’s most impressive Baroque buildings. 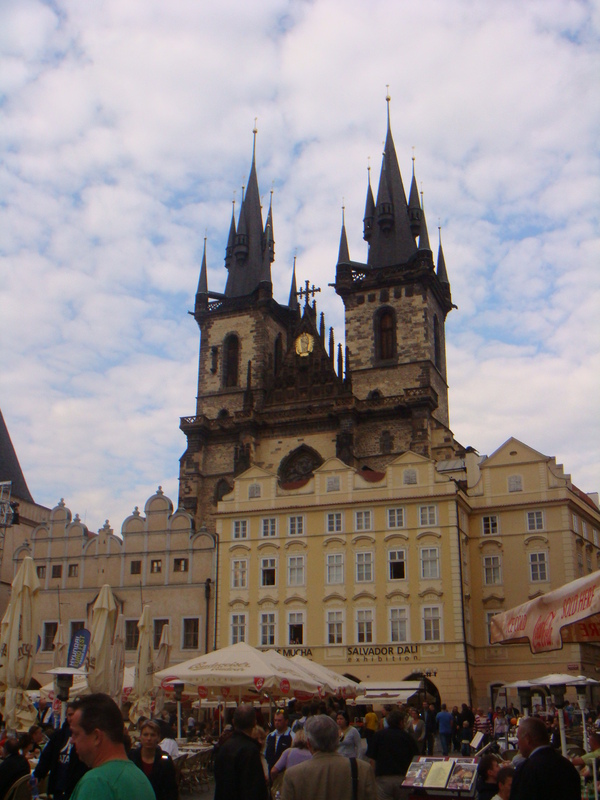 Its dome and bell tower are Malo Strana landmarks, symbols of the city of Prague. The Cathedral’s story dates back to 1223, when it began life as the modest parish Church of St Nicholas in the village below Prague Castle. In 1702 Kristof Dienzenhofer designed a magnificent new Cathedral to replace the humble parish church of St Nicholas. Construction continued after his death under Kilian Ignac Dietzenhofer who also designed the vault and the landmark green dome. Two new wings were added. The left houses the Chapel of St Barbara and the right, the chapel of St Anne. In 1752 an 80 metre bell tower, by Anselmo Lurago completed the Cathedral. During his years living and composing in Prague, Wolfgang Amadeus Mozart frequented St Nicholas and played on its organ. During the Communist era St Nicholas ceased to be used as a house of worship. Although today Masses have resumed, St Nicholas has gained fame as a music venue and concerts are held here all year round and every day during the high tourist season. The Rudolphinum is one of Prague’s most elegant Neo-Renaissance buildings. Like the National Theatre, the Rudolphinum was constructed in the late 19th century during the resurgence of Czech national pride and culture. The Rudolphinum was designed by architects Joseph Zitek and Josef and the building was completed in 1884. It was originally intended as art gallery but in 1946 it became the home of the Czech National Orchestra. From 1918 to 1938 and again, briefly, after World War II, it served as the seat of the Czech Parliament. Today the Rudophinum is most famous for its amazing Dvorak Hall, a music auditorium which, at the least in the Czech view, boasts the most perfect acoustics in the world. According to the stories the acoustics are so sensitive, that even a coat of paint on the wall of the great hall can alter the sound. 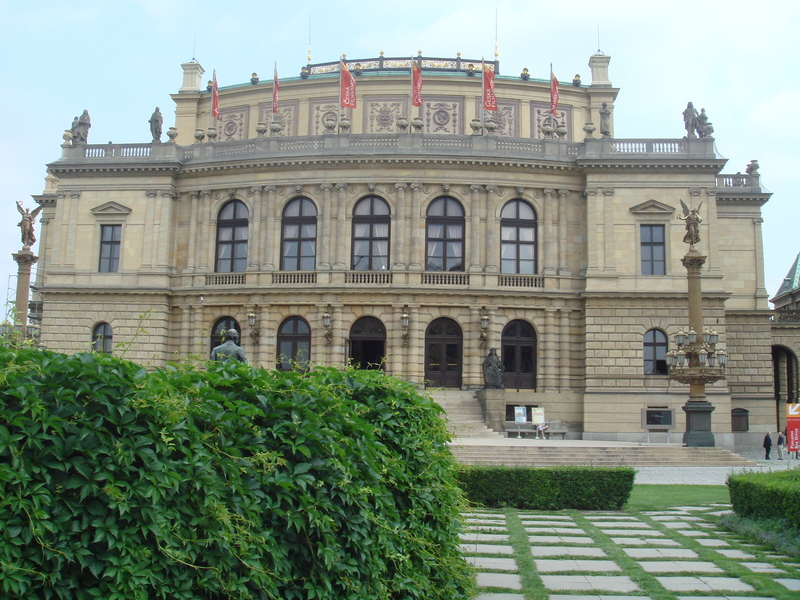 The music halls of the Rudolphinum host Prague’s famous Spring and Autumn Music Festivals. But the Rudophinum has not been completely colonized by the performing arts, part of it remains true to its original purpose and is home to the splendid Gallery of Modern Art. .
Mediaeval, Gothic, Romanesque, Renaissance and Baroque, Prague’s towers are as much a part of its magic as its castle, its bridges, its squares and its beautiful buildings. They perch on bridges, rise from rooftops or from ramparts and loom on corners, at junctions or the end of streets. They all have their own special style, charm and story. But still, there are two that stand as it were, above the rest. Known for centuries as the New Tower, the tall dark tower that marks the end of Prague’s Celetna Street was originally one of the 13 entrances to the Old Town. It was modelled on Peter Parler’s 14th century Old Town Bridge Tower and was designed to form part of the grand landscape surrounding the royal residence of King Vladimir Jagellon. Work began on the tower in 1475 but when King Vladimir moved his court across the Vltava to Prague Palace, it was left unfinished. The building was used in the 17th century as a storage tower for gunpowder, hence its present name – the Powder Tower. Construction did not resume on the tower until 1875, when it was redesigned and rebuilt by Josef Mocker. It was finally completed in 1886. Today, the Powder stands at 69.5 metres. 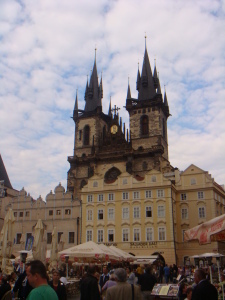 It peers over the shoulders of the buildings lining the Old Town Square and dominates the skyline beyond. 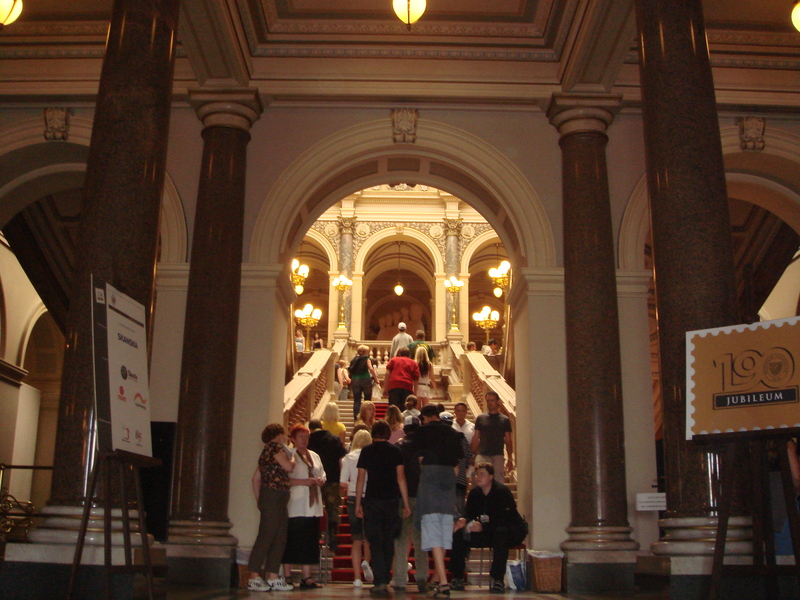 It houses a fascinating exhibition on the building’s history and architecture and is open to visitors between 10.00 and 18.00 daily, from April to October. 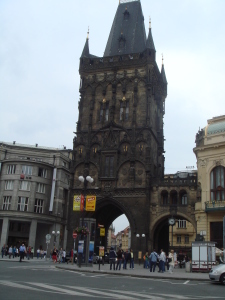 The Jindrisska Tower sits in the middle of Prague’s busy Jindrisska Street. 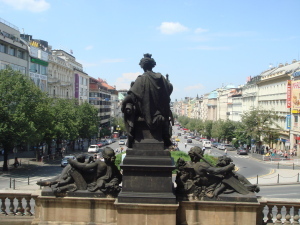 Since the 14th century this thoroughfare, which gives the tower its name, has linked three of the city’s main points – Charles Square, Wenceslas Square and Senovazne Square. Today Jindrisska Tower is open to visitors who can take the panoramic view from its summit, or study its history and architecture in the exhibition hall. In 2003, the Jindrisska Tower restaurant opened. Lined with timber from the original belfry, it also displays the first bell, Maria in pride of place. Every day at 9.00a.m., 12p.m, 3.00p.m and 6.00p.m passers-by in the surrounding streets, can enjoy one of the belfry’s repertoire of 1,000 peals every day at 9.00a.m, 12.00p.m, 3.00p.m and 6.00p.m. The Old Town Square, or Staromestke Namesti, is one of Prague’s busiest, most beautiful and most memorable corners. Staromeske Namesti began life in the 10th century as a market place. Merchants from all over Bohemia and Europe came to buy and sell in the flourishing new city of Prague. 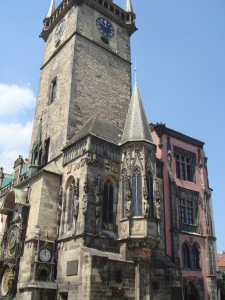 In 1338, The Old Town hall was added to house Prague’s first city council and the square became the centre of civic administration and community life. The Old Town Square has a stunning parade of Czech architecture, with Romanesque, Mediaeval, Gothic, Baroque and Cubist buildings side by side. The Old Town Hall, the Church of St Nicholas and the old baroque palace which now houses the National Gallery, are three of its stars. At the centre of Staromeske Namesti stands the monument to the great Czech reformer and nationalist Jan Hus . Hus, who was the first Rector of Charles University, was a vehement critic of the corrupt Catholic Church and the Papacy. His incineration at the stake led to the 14th and 15th century Hussite wars. 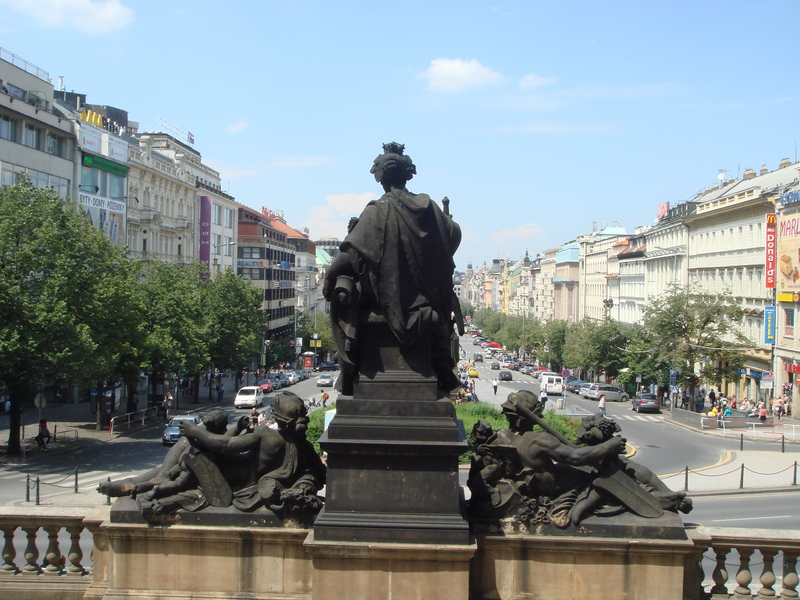 The statue was erected on July 6th, 1915, to mark the anniversary of Jan Hus’ death. If the Old Town Square is the hub and heart of historic, touristic Prague, then Wenceslas Square is the centre of the modern, popular city. Originally designed in 1348 by the Emperor Charles IV as a horse market, the 750 by 60 metre square is in fact more of a rectangle. More a Boulevard than a Square in function, it is lined with shops, hotels, casinos, restaurants, discos, offices and food stands. Traffic rolls continually up one side and down the other and trams cut across its centre. Its pavements and gardens are crowded with people day and night. At the top end of Wenceslas Square the golden cupola of the National Museum dominates the skyline. From just below the grand old building, St Wenceslas, the legendary father of the Czech nation, surveys the scene through unblinking stone eyes. Interestingly, Wenceslas’ horse, or rather its tail, is a favourite meeting place for the people of Prague. Just below the Wenceslas statue, a small round flowerbed with a modest memorial remembers the “victims of communism” Nearby a small bronze cross marks the place where 20 year ole philosophy student Jan Palach set fire to himself on January 16, 1969, in protest against the Soviet invasion. One million people attended his funeral which turned into a major demonstration against the communist regime. Since the death of Jan Palach, Wenceslas Square has become a national symbol and the traditional centre for demonstrations and protests. 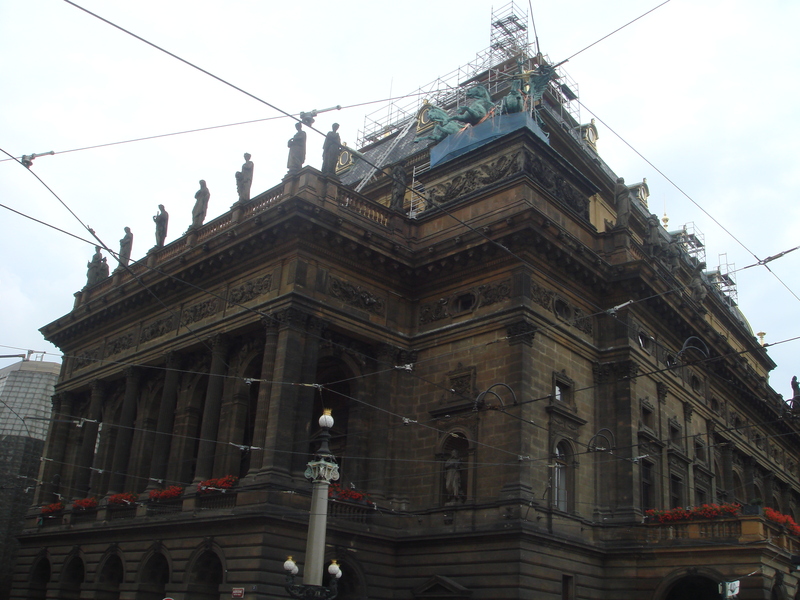 Prague’s National Theatre at Norodni, 1 in the New Town is a landmark. Not only is it a great beauty of Neo-Renaissance architecture, but it represents an important milestone in the evolution of a truly Czech culture. In the late 1900s, after almost two hundred years under the heel of the Habsburghs, a Czech Nationalist movement was born. With it came a renaissance in Czech culture and the establishment of some great institutions to celebrate it. The National Theatre also embodies the spirit of Czech national pride and unity as the funds for the construction of the building were donated by the Czech people – rich and poor alike. Although the foundation stone was laid in 1868, it was not until 1881, that the neo-Renaissance building was opened. Soon after its first performance, a concert in honour of the Crown Prince, Rudolf, a fire ravaged the building. Undeterred by the tragedy, the people of Prague set about raising more funds to reconstruct the theatre. In a mere 47 days one million florins had been collected. Under architect Josef Schulz, the magnificent theatre was re-built, this time incorporating electric lighting and a steel constructed stage. Its first performance, on the 18th of November, 1883 was Smetana’s opera Libuse, the story of Princess who founded the first Czech Dynasty – a fitting celebration of Czech nationalism and unity. In 1977 the theatre was closed once again for reconstruction. A new glass wing, in the somewhat stark Communist Era style, was added to house administrative offices and the box office. On 18th November 1983, the theatre’s 100th anniversary, it opened again with a performance of Smetana’s Libuše.